It’s almost December. Time to dig out your Elf on the Shelf. 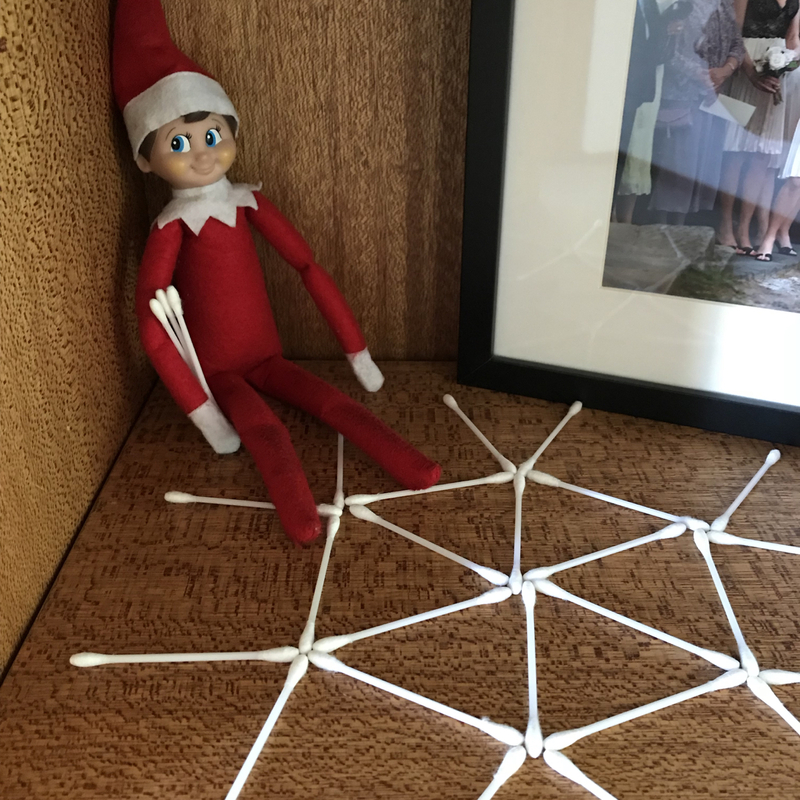 Our Elf has been bringing joy to our children/complicating our lives since 2014. With all that practice, I’ve mastered the art of no fuss Elf placement. Here’s the Lazy Mum’s guide to Elf on the Shelf. 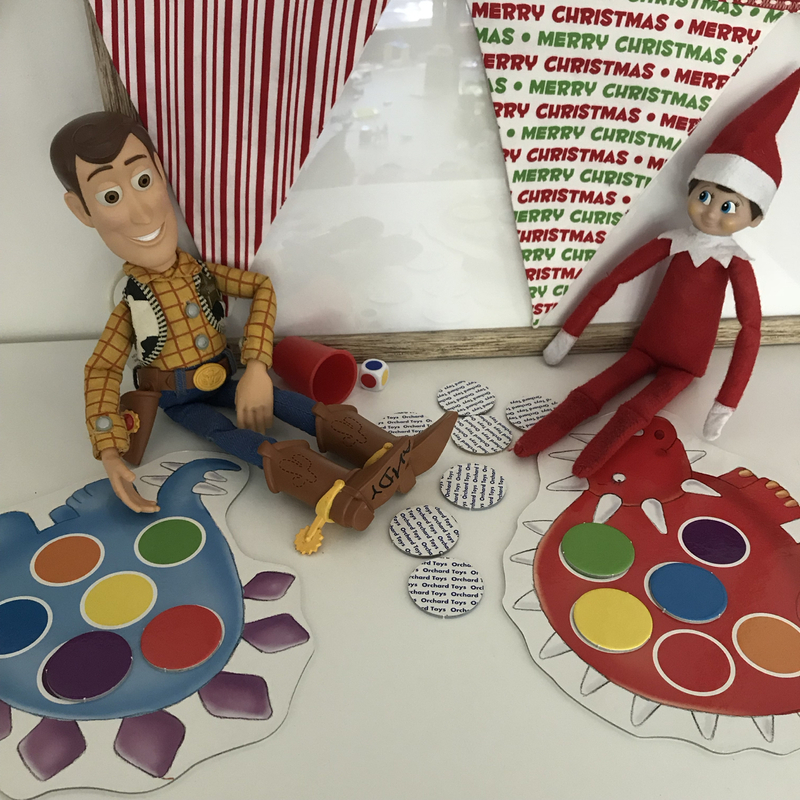 It’s full of simple, easy to do Elf ideas that require minimal props or planning. December is already busy, ain’t nobody got time for elaborate Elf antics. 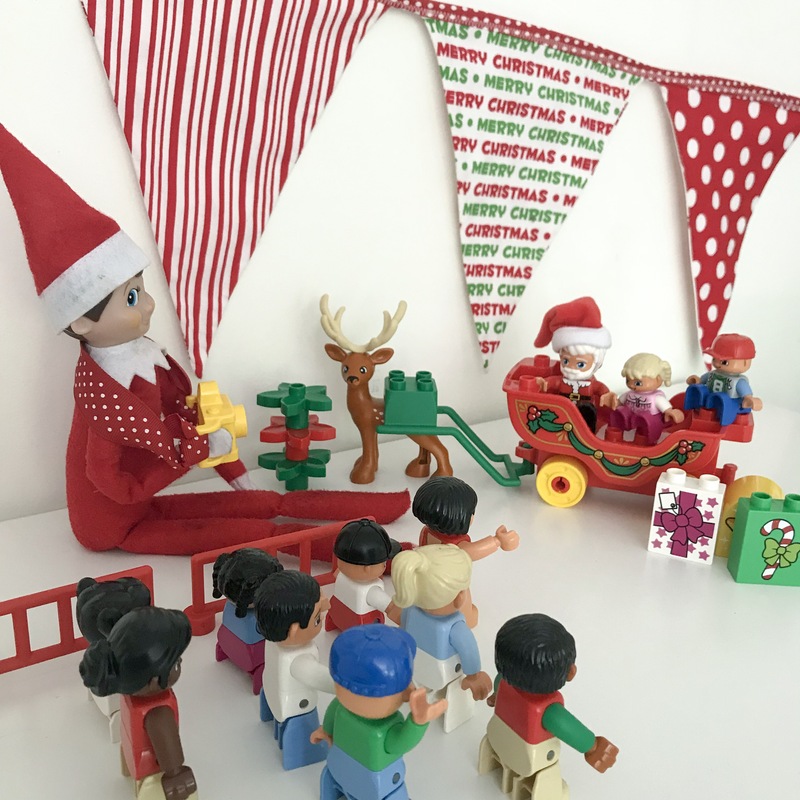 The Lazy Mum’s Guide to Elf on the Shelf uses your kids toys, takes advantage of the Christmas decorations, gives you a day or two off, and has the Elf on adventures in every room of the house. 1. He’s Back! The Elf arrives holding an “I’m back” sign. 2. Sleeping Elf. 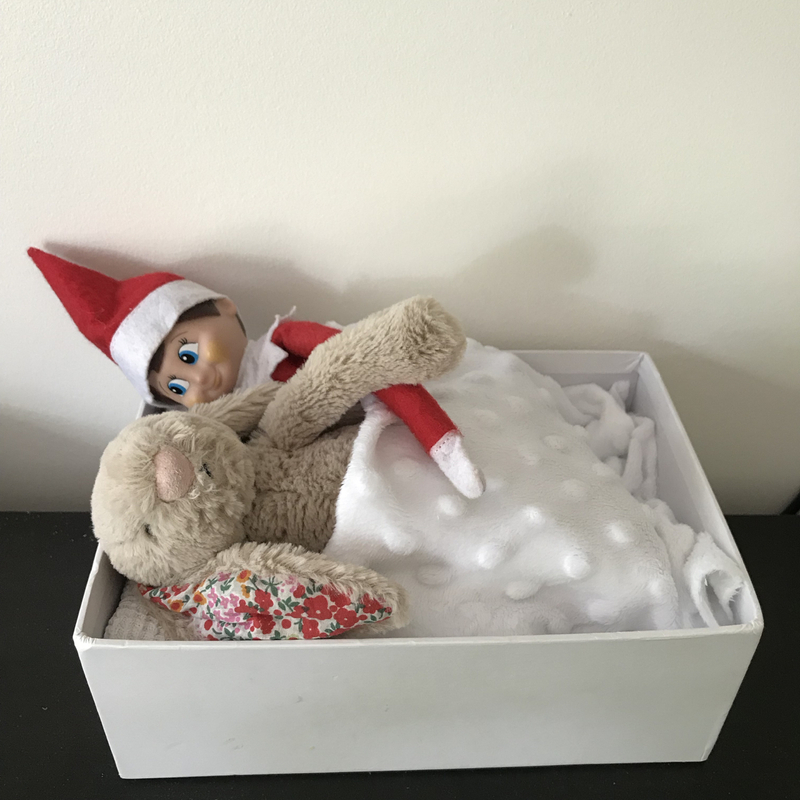 Make a comfy bed for your Elf and a soft toy. 3. 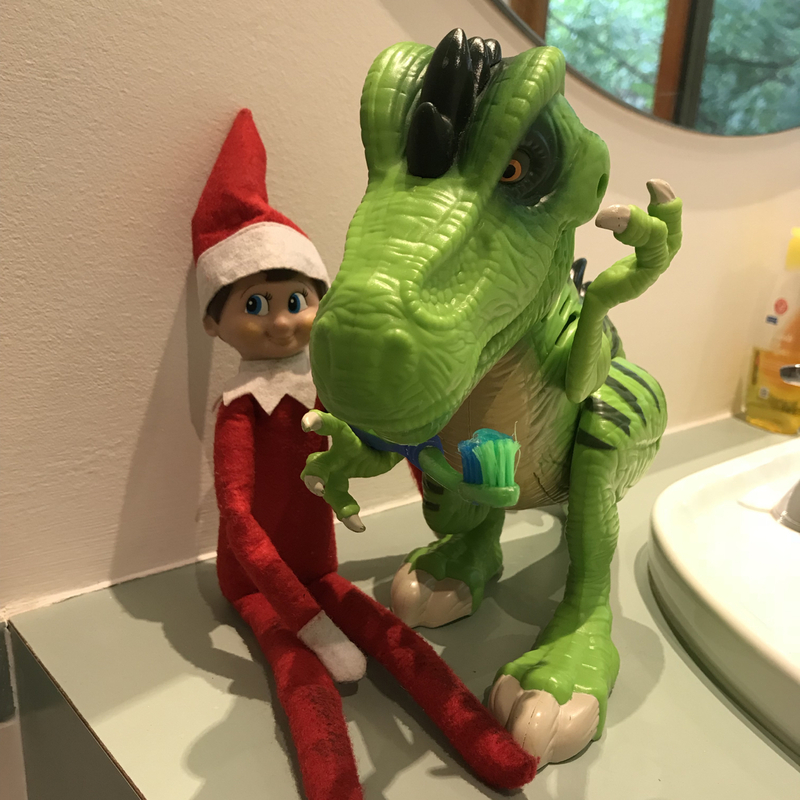 Dentist Elf, the toys need clean teeth. 4. Story time! Elf reads the toys a story. 5. Hostage Elf. 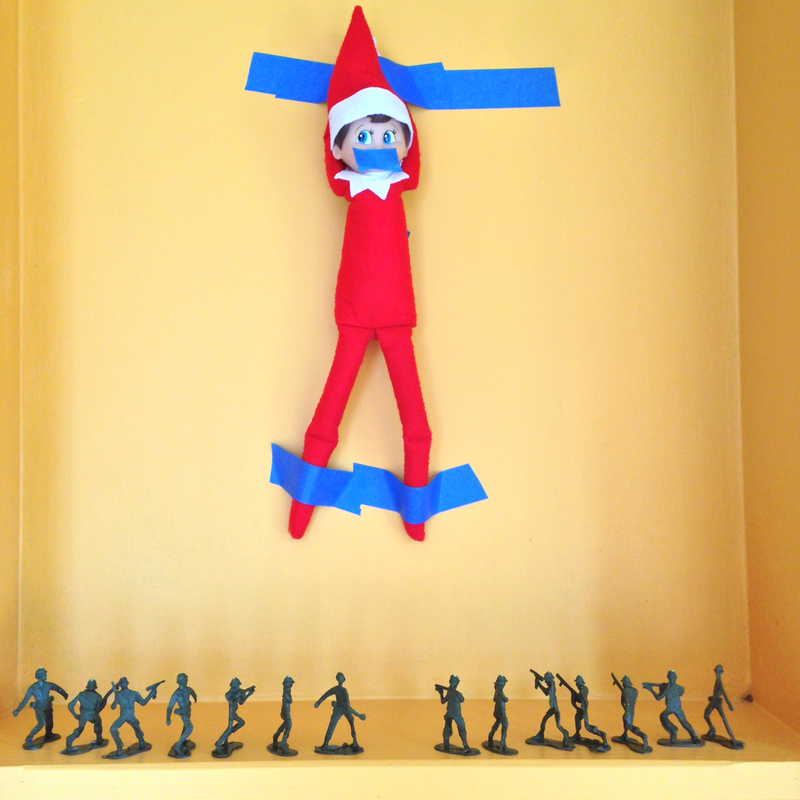 The Elf is taken hostage by toy soldiers and taped to the wall. 6. Captured Elf. 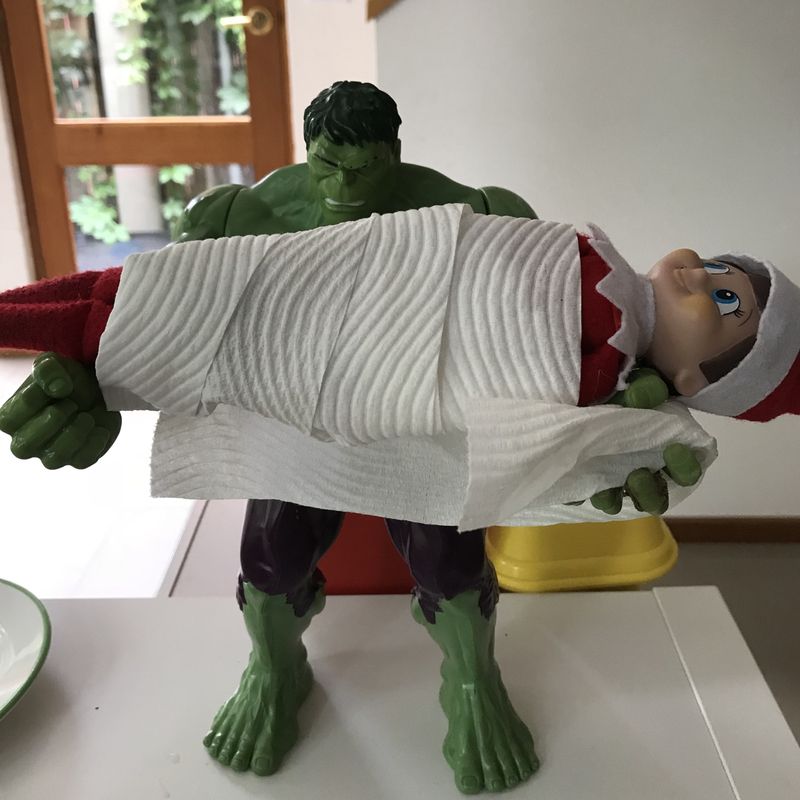 A toy (Hulk Smash for extra appeal) wraps the elf in toilet paper. 7. Game on. Set up a toy and your Elf playing a board game or doing a puzzle. 8. Message time! 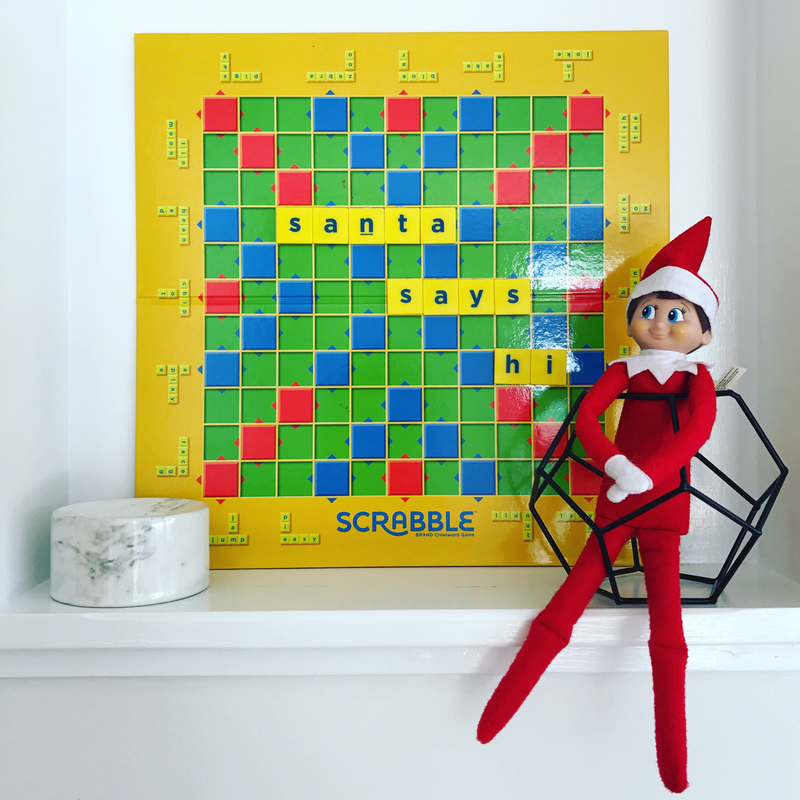 The Elf spells out a message using scrabble letters. BE KIND TO YOUR MUM!! 9. Santa Photos. The Elf is a photographer, taking Santa photos of other toys (my most complicated Elf on the Shelf ever)! 10. Swinging Elf, on a toilet roll swing. 11. Day Off! 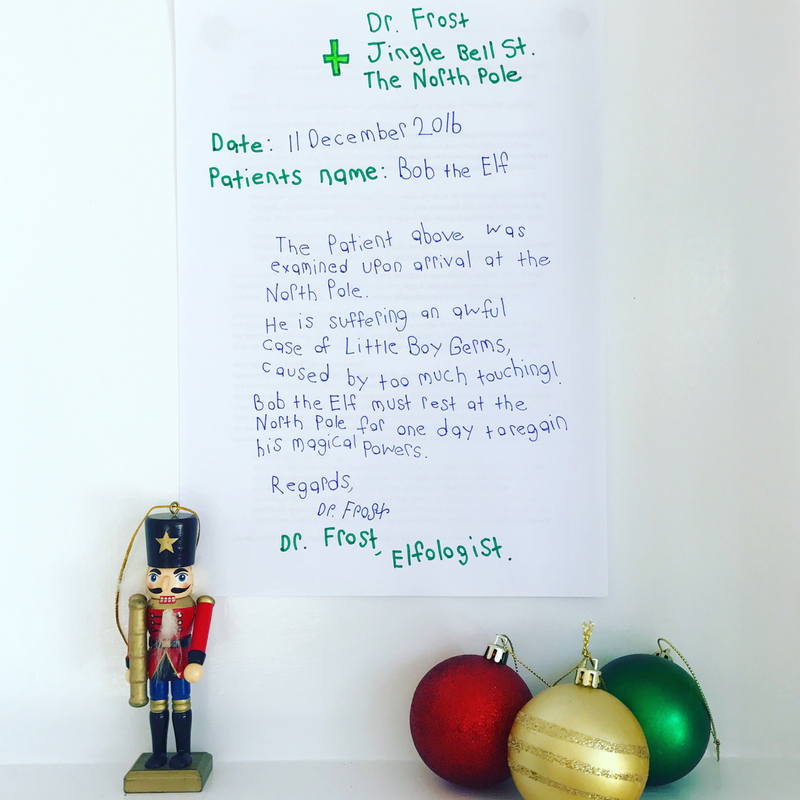 The Elf has a nasty case of kid germs and needs a night at the North Pole recovering. 12. Farting Elf. 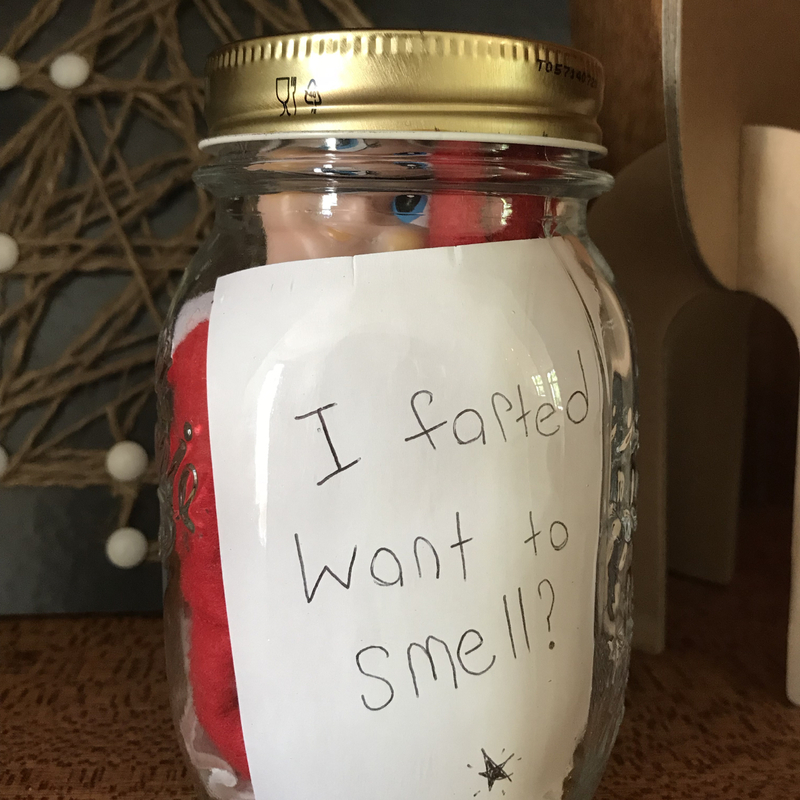 Put your Elf in a jar and dare the kids to take a whiff. 13. Stuck! The Elf gets tangled in the Christmas tree. 14. An extra. 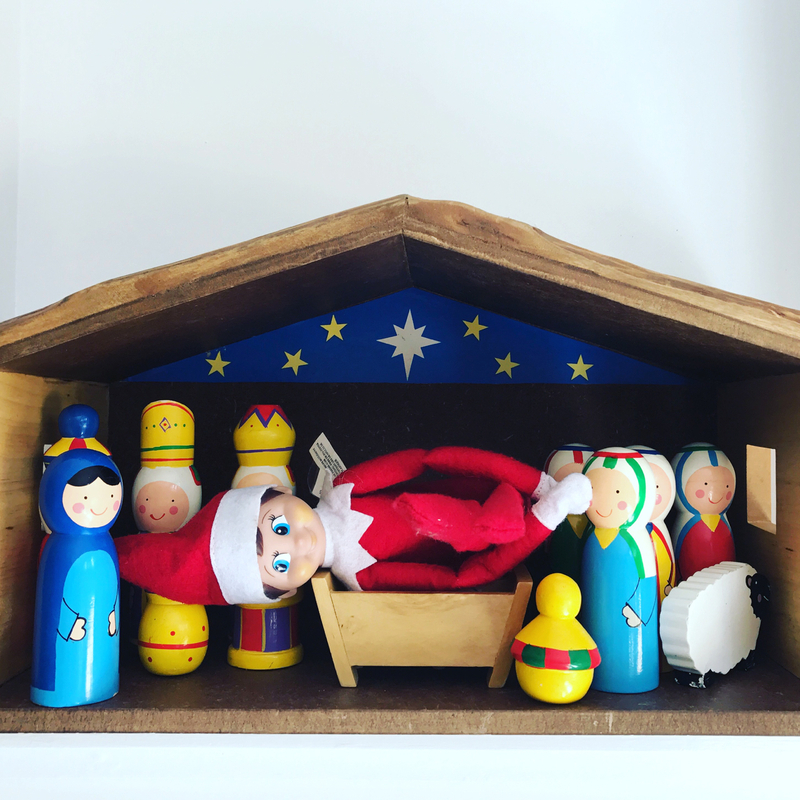 The Elf sneaks into the nativity set. 15. Peek-a-boo. The Elf peers out from a Christmas stocking. 16. Graffiti Elf. Use a whiteboard marker to draw glasses, moustaches and hats on family photos. 17. Help! 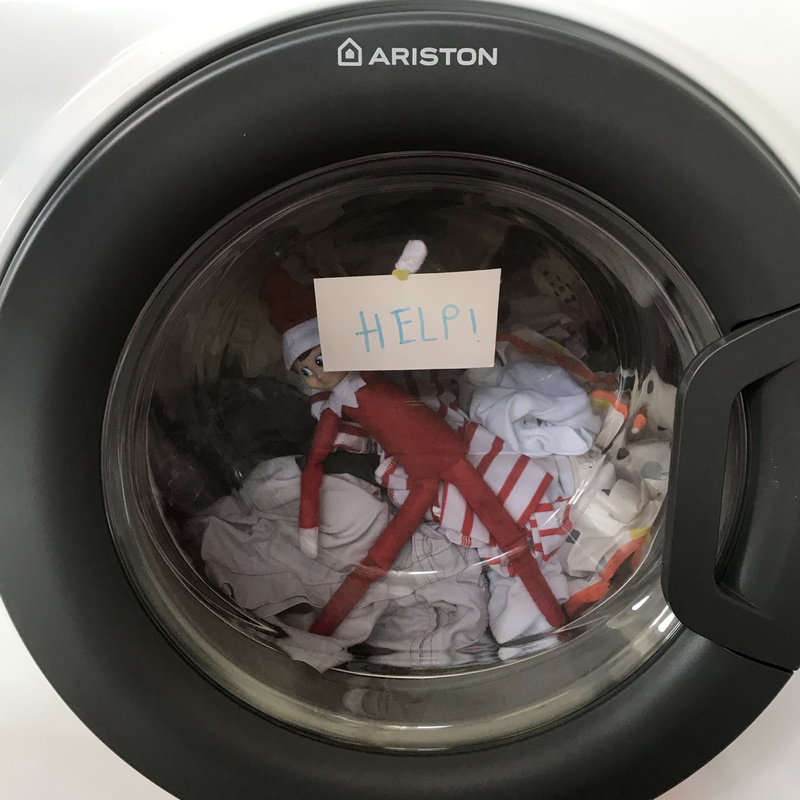 The Elf is trapped in the washing machine. 18. It’s getting hot in here! 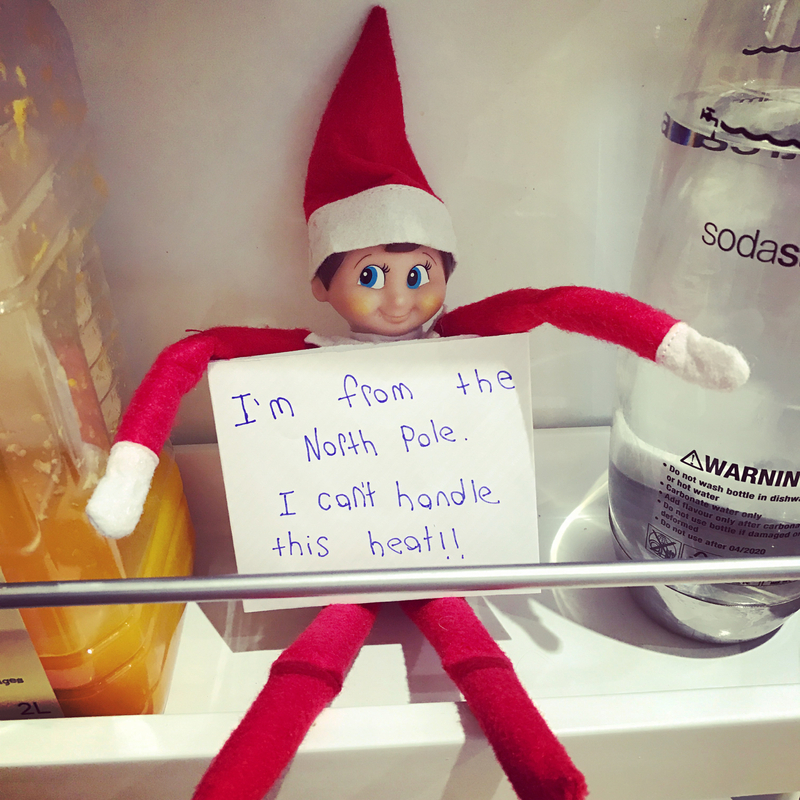 The Elf takes respite from the heat in the fridge. 19. Call back. The Elf is needed in the North Pole and heads back back to help Santa for a day. 20. Tea time. 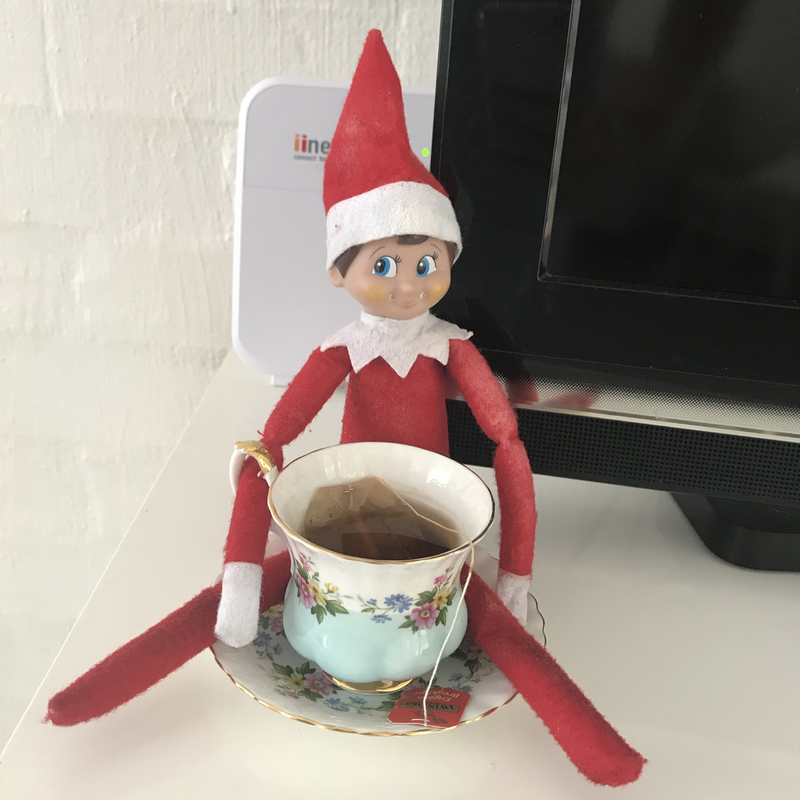 The Elf helps himself to a cup of tea. 21. Mischievous Elf. 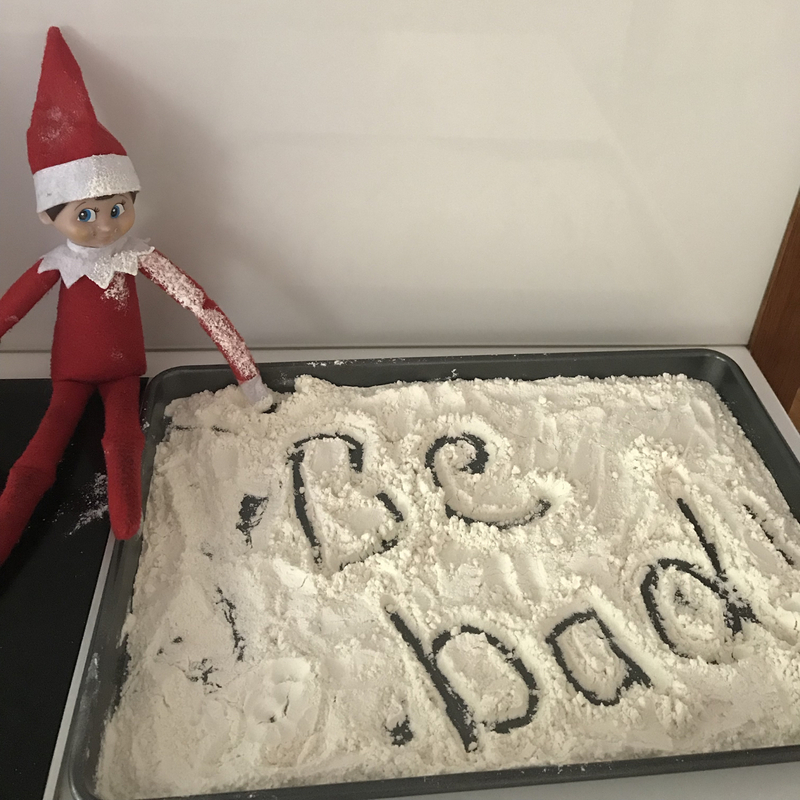 Write a cheeky message in flour. 22. 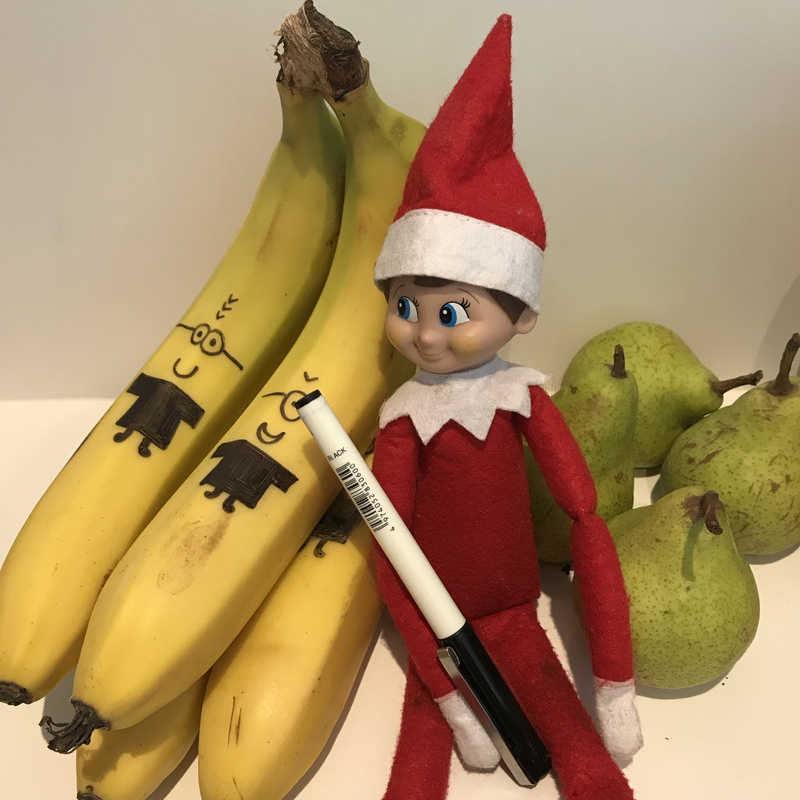 Elf goes bananas, by drawing faces on bananas. 23. Snowflake Elf. Make a snowflake from cotton buds. 24. Shaving elf. Little bit of shaving cream and a razor will have your Elf looking his best. 25. Bathtime elf. The Elf reclines in a bubble bath (cotton balls)! 26. Pooping elf. 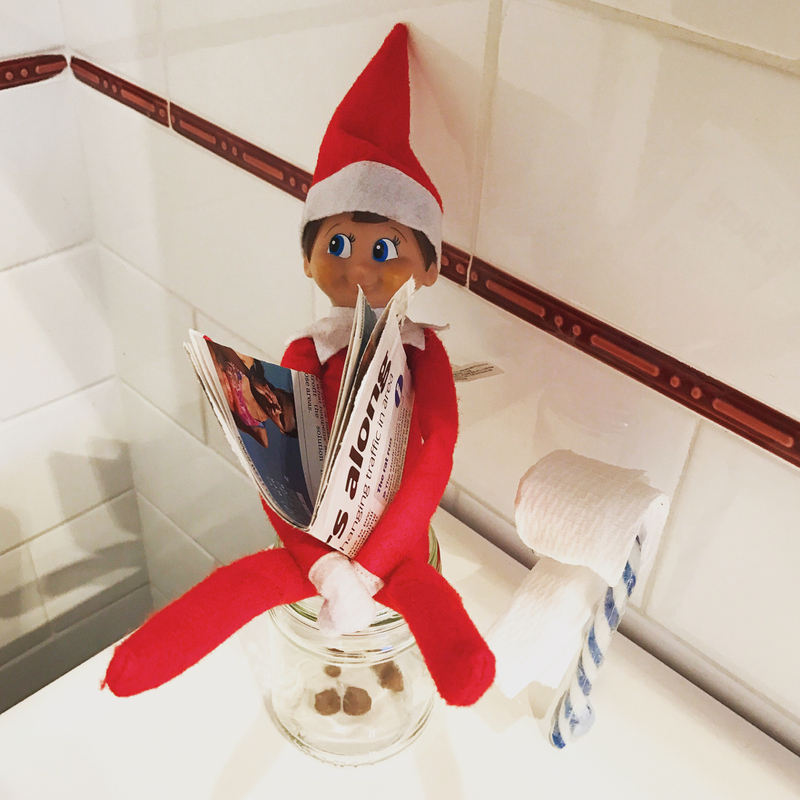 Make the Elf a toilet, complete with candy cane toilet roll holder, and chocolate chip poo. 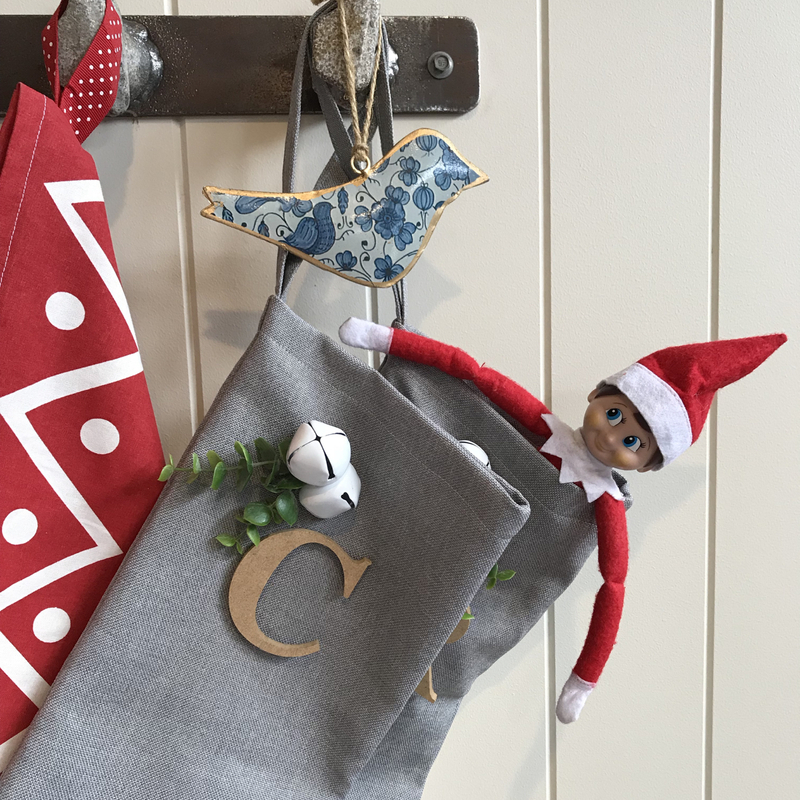 Fingers crossed my Lazy Mum’s guide to Elf on the Shelf has given you some no-fuss elf ideas! For more simple Elf inspiration, pop over to Instagram and follow my stories. While you’re there, tag @lifeonwallace in your Elf photos, I always need new Elf antics. These are brilliant – the farting elf in a jar is my favourite! Wish they’d had elf on the shelf when I was a kid! The fart in the jar was popular here too, unsurprisingly! Thank you, hope it’s given you some inspiration! These are fantastic. 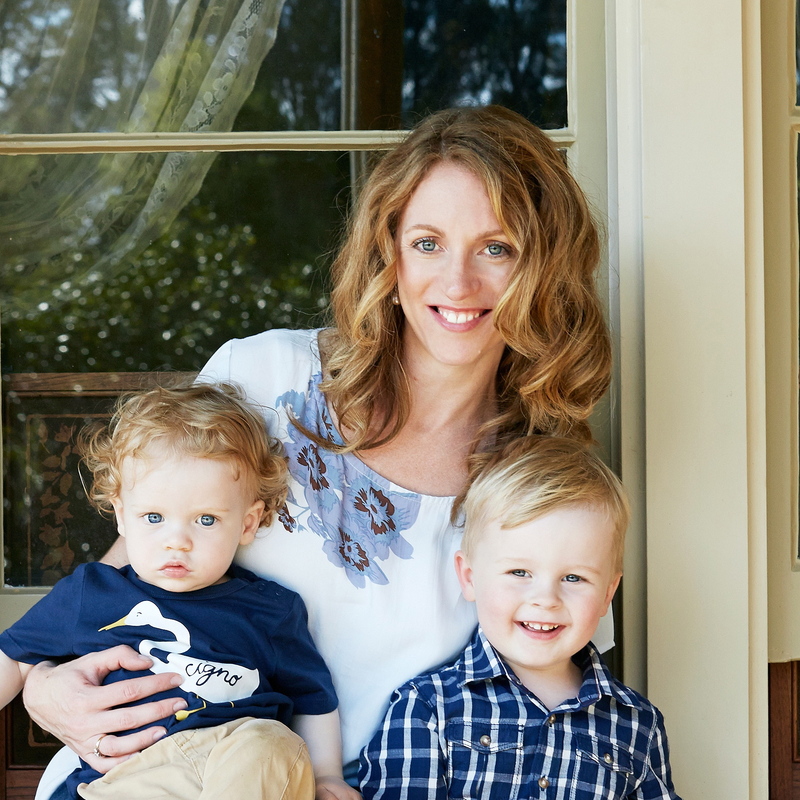 I did an advent calendar full of fun activities, games and gifts when my kids were young. The Elf thing started later and I always hated seeing posts because I know so many parents felt pressure from it. Your ideas would have saved the day as creative and fun but not insanely complicated.